MORE on the events sponsored by "close guantanamo now....."
Tom Wilner and Andy Worthington, with Laura Pitter, the interim deputy director of Human Rights Watch’s Americas program, discuss the prison’s present and future, in a panel discussion moderated by New America’s David Sterman, asking, "What will happen to the prison and its detainees in the remaining years of the Trump administration? Will anyone else be released? Will the prison ever close?" See the event page here, and please RSVP if you’re coming along. Andy Worthington joins speakers from 12 rights organizations at the annual vigil outside the White House calling for the closure of Guantánamo: Amnesty International USA, the Center for Constitutional Rights, Close Guantánamo, CODEPINK: Women For Peace, Council on American-Islamic Relations (CAIR), Defending Rights & Dissent, Justice for Muslims Collective, September 11th Families for Peaceful Tomorrows, Torture Abolition and Survivors Support Coalition International (TASSC), Voices for Creative Nonviolence, Witness Against Torture and the World Can't Wait. Please also check out Witness Against Torture’s page about their Fast for Justice, a week of events in Washington, D.C. involving fasting and political actions. As Revolution Books states, "Andy Worthington, the British journalist who has covered the men imprisoned in the U.S. torture camp at Guantánamo since 2006, speaks on the state of the prison under Trump; the 40 men who are still held, and on what released prisoners have encountered as they've been scattered across the world. Andy, a member of The Four Fathers, may sing for us. Q&A to follow." 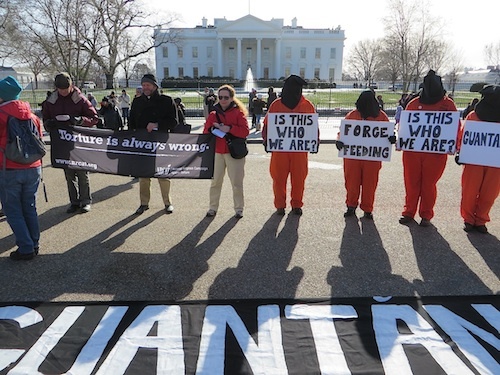 Seven years ago, on January 11, 2012, the 10th anniversary of the opening of the prison at Guantánamo Bay, the attorney Tom Wilner and I set up the Close Guantánamo campaign, to maintain the pressure on Barack Obama to fulfill the promise to close the prison that he made when he first took office three years before. As we all now know, Obama sadly failed to fulfill his promise, and we’re now nearing the start of Donald Trump’s third year as president, in which Obama’s failed promise has been discarded as though it never existed. Donald Trump is an enthusiast for keeping Guantánamo open, an imbecile who lacks the ability to understand that the prison’s very existence is fundamentally, devastatingly wrong, as its creator, George W. Bush, finally recognized in his second term in office, and as Barack Obama also recognized throughout his presidency, even though he lacked the political will to follow through adequately on this recognition. To mark the disgraceful 17th anniversary of the opening of the prison, where 40 men are still held, mostly without charge or trial, our co-founders Andy Worthington and Tom Wilner will be in Washington, D.C. for two events — a panel discussion and a vigil outside the White House — and Andy, who is visiting from the UK, will also be in New York for an event two days later. All the details can be found in our latest article, Close Guantánamo Events Marking the 17th Anniversary of the Opening of Guantánamo. If you’re in Washington, D.C. or New York, we hope to see you — and we hope we can count on your support throughout 2019 as we continue to make the case for why Guantánamo must be closed. If you can make a donation to support our work it will be very greatly appreciated. To do so, visit the homepage of our website, and click on the ‘Donate’ button to make a payment via PayPal. If you can make a regular monthly donation, that would be especially welcome. Please tick the box marked, "Make this a monthly donation," and fill in the amount you wish to donate every month. P.S. Please, if you will, also ask your friends and family to join us — just an email address is required to be counted amongst those opposed to the ongoing existence of Guantánamo, and to receive updates of our activities by email. Please also join us on Facebook and Twitter.